West Indies' top-order batting negotiated a testing two-hour period with a combination of luck and skill to reach the lunch interval at 126 for one replying to England's first innings total of 187 on the second day of the second Test of the three-match series at the Sir Vivian Richards Stadium in Antigua on Friday. 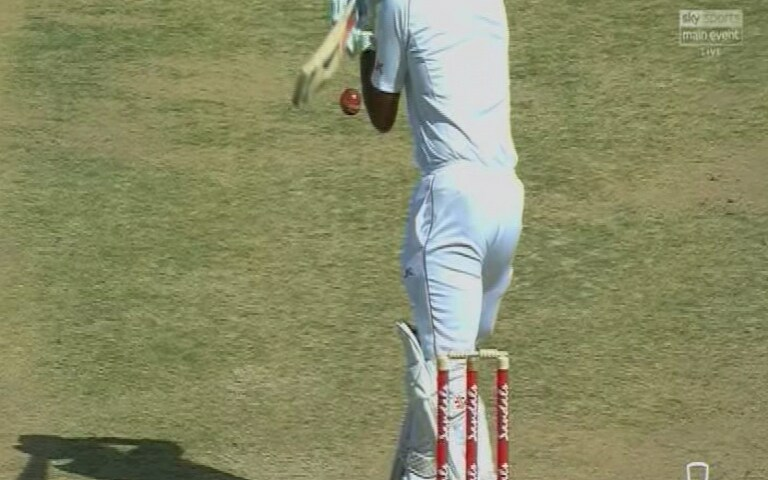 But, the Windies skipper cleaned his stumps with a beauty. Former Test captain Alastair Cook has called for England batsmen to "adapt" following their struggles in the West Indies, the BBC report. It won the first test in Barbados by 381 runs in four days. Bowling: J. Anderson 21-3-58-0, S. Broad 28-13-42-3 (1w), B. Stokes 25-6-58-1 (1nb), S. Curran 13-0-38-0 (1nb), M. Ali 23-4-54-2, J. Denly 1-0-1-0. John Campbell finishes the game with a six! Darren Bravo in many ways set the victory for Windies with a marathon 216-ball fifty, the slowest ever by a West Indian. After an opening partnership of 35 runs, Rory Burns was the first man to depart for 16 runs. The Windies openers completed the chase of 14 runs in 2.1 overs to switch to the celebration mode. Joseph's commitment to the cause was also noted. England kept on losing wickets at regular intervals and were eventually all out for 132. Tottering on 96 for six, England's decline continued when Ben Foakes was lbw to Roach for 13 on review and three balls later in the next over, Jos Buttler fell lbw to Holder, after top-scoring with 24 off 48 balls with five fours. Kraigg Brathwaite, the vice-captain, will step up to lead the team in Holder's absence, having done so in two Tests on West Indies' tour of Bangladesh a year ago, which Holder missed due to injury. The series win is Windies' first triumph over a major Test-playing nation, home or away, since they beat New Zealand in 2012 and also the first over England since 2009. Missing Holder will be a big blow for the hosts. They are averaging just 16.05 runs per wicket, their lowest in a series since the 1880s.